Trying to manage your blood sugar levels when taking insulin? Systemic Care is formulated to help support healthy bodily systems and organs as part of a healthy diet and regimen for people taking insulin to balance their blood sugar levels. Systemic Care delivers nutrients to help support the body’s ability to manage healthy pancreatic function. Balance your blood sugar levels every day! Give your body and organs the nutrients they need to support their healthy functioning! In order to produce a systemic supplement as effective as Systemic Care...we NEVER compromise on quality...giving the world’s best value for money and best possible ingredients. For example, Luteolin, of which we include 268mgs in a full daily dose, costs more than 10 times as much as a quality green tea extract. But...it is a crucial component of the formula! There are other important nutrients which you can learn more about by going to our Ingredients tab. Whether you simply have blood sugar imbalances or you are Type-1 or Type-2 diabetic...watch your sugar levels, and consult with your doctor. Always have appropriate tests done with a health professional. Other Ingredients: Microcrystalline Cellulose, Dextrose, Enteric Coating (Purified Water, Ethylcellulose, Ammonium Hydroxide, Medium Chain Triglycerides, Oleic Acid, Sodium Carboxymethyl Cellulose, Talc, Polydextrose), Maltodextrin, Silicon Dioxide, Sodium Carboxymethyl Cellulose. Important Note: Do NOT use Systemic Care as a replacement for any diabetes medication. Consult your doctor or GP if you are concerned about your blood sugar levels. For optimal results split into 2 doses per day; morning and later in the day. Combines well with our Omega 3 Fish Oil products, Total Balance and Kiwi-Klenz. Important Note: Do NOT use Systemic Care as a replacement for any diabetes medication. It is best to use Systemic Care as part of your diet when taking insulin to help maintain a healthy blood sugar level. Consult your doctor or GP if you are concerned about your blood sugar levels. 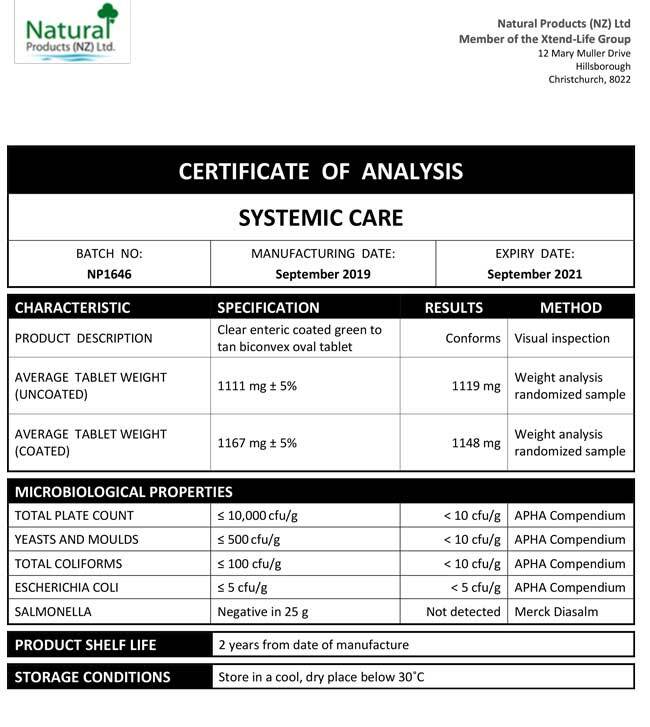 We have included below a copy of a typical Certificate of Analysis (CoA) for our Systemic Care product. Please note that we produce our products regularly throughout the year. You can be assured that every bottle, from every batch will meet these exceptional standards, and it will be from a current, recently produced batch. You will note that there are two columns which are headed 'Specification' and 'Results' respectively. The specifications are simply our minimum standard to which each batch of Xtend-Life Systemic Care has to conform, otherwise we would not release it. The results are the actual results from the independent laboratory that did the testing. What is the recommended dosage for Systemic Care? Is Systemic Care a replacement for my diabetes medication? Systemic Care is not a replacement for any diabetes medication. When you begin using the Systemic Care health supplement, it is essential that you do not stop using your current diabetic medication if you are on any. Leave a gap of at least three hours between taking your medication and Systemic Care if you can. You will need to closely monitor your condition with your doctor, especially if you wish to use Systemic care in conjunction with diet to maintain healthy blood sugar levels when taking insulin. Again, it's important to stress that Systemic Care is NOT an alternative to Diabetes medications, but you may find it helpful to manage your condition with diet, in conjunction with your doctor. By following the Systemic Care protocol, plus incorporating an effective dietary and exercise regime, many people may find that they are able to achieve better general health, energy levels and blood sugar balance when taking insulin as recommended by a doctor. How will I know if the Systemic Care supplement is working? Firstly it is important to remember that this is a nutritional supplement. This means it works with your body to help your body function properly itself, not forcing it to do something it cannot or should not do. Systemic Care is a supplement that not only aims to help your current condition but also acts to support and maintain the health of your vital organs which begins from the time you start taking this supplement. The extent of the benefits will vary from person to person. The results may be subtle and gradual and even if you do not 'feel' an immediate difference you can feel confident that the supplement is doing its work to support your internal health. If you are using Systemic Care at the same time as insulin to help maintain a healthy blood sugar level, it will be important for you to monitor your blood sugar levels closely, as directed by your doctor. What else can I do to enhance the benefits of taking Systemic Care? Our recommended protocol for taking Systemic Care for optimum efficacy is 6 tablets per day (1 bottle per month). To support the healthy function of your organs you could take this together with 2 soft gels per day of our Omega 3/DHA fish oil products. For the most effective supplement program, we would recommend combining a full dose of Total Balance. If you use Total Balance, then the dosage of Systemic Care should be reduced to 3-4 tablets per day. Of course, the best results will come from using this product in conjunction with a healthy diet, with due attention paid to sugar intake, as well as regular physical exercise. What if I don't want to take the recommended daily dose? We strongly recommend that all of our customers take the recommended daily dose whenever possible, as this is required to gain the maximum benefits that we say may be expected from our supplements. Taking the recommended dose ensures you will obtain an even distribution of all ingredients in the blend. Taking less may mean that you miss out on some ingredients and therefore you may not get the best possible results. Can I use Systemic Care if I am allergic to insulin? Insulin allergies occur because injectable insulin is not exactly the same as naturally produced human insulin. Insulin medication is almost exclusively a form that is genetically engineered to resemble natural human insulin. However, the chemical makeup of these human insulins is often modified slightly to change the duration of the insulin action. In some rare cases, insulin from animal sources is also used to treat human patients. Allergic reactions occur because of these differences, as well as the additives, bacteria, and impurities that are present in synthetic human and animal-derived insulin. Systemic Care helps support the vital organs of insulin production and glucose metabolism to function optimally and normally. Any insulin produced is therefore produced naturally by the pancreas, not by the Systemic Care ingredients themselves, and you will not, therefore, have an allergic reaction. Can I use Systemic Care to help with Gestational Diabetes? Gestational diabetes (gestational diabetes mellitus) is a condition in which women without previously diagnosed diabetes exhibit high blood glucose levels during pregnancy. As well as genetics, hormones produced during pregnancy (oestrogen, cortisol, and human placental lactogen) are thought to reduce a woman's sensitivity to insulin in some susceptible women, resulting in high blood sugar levels. Gestational diabetes generally has few symptoms and it is most commonly diagnosed by screening during pregnancy. Women with gestational diabetes are at increased risk of developing type 2 diabetes mellitus after pregnancy, while their offspring are potentially at risk of developing childhood obesity and type 2 diabetes later in life. Unfortunately, we cannot recommend our Systemic Care formula during pregnancy. However, if you are known to be susceptible, have a family history of diabetes, obesity, have given birth previously to a very large infant, a stillbirth, or a child with a birth defect, or are a pregnant older woman, you could opt to have treatment for gestational diabetes. This focuses on keeping blood glucose levels in the normal range via dietary recommendations and exercise, daily blood glucose monitoring and potentially insulin injections during this period if your doctor recommends this. Once you have finished breastfeeding, and plan to have further children or desire further general protection, Systemic Care could be taken to support the healthy function of your organs in this respect. Can Systemic Care help with any other conditions? The ingredients contained in Systemic Care may help to support and maintain the health of the vital organs including kidney health, eye health, cardiovascular health, circulation, and even liver function. Please contact us if you require assistance in determining if this product is the best choice for you. Can my child take Systemic-Care? Yes, children may use Systemic Care. For children over the age of five years old, we recommend 1-2 tablets per day. We recommend 1 tablet per day for children who have blood sugar concerns and 2 tablets per day for children with either diabetes type one or type two. Of course, the best and the first line of support for children in addressing blood sugar levels is to make necessary changes to the diet and lifestyle, in the case of Type II diabetes especially. Systemic Care is designed to be used in conjunction with dietary and lifestyle measures, to achieve the greatest results. We recommend consulting with your child's doctor before beginning this supplement. We would also highly recommend combining this with Total Balance Children's and Omega 3/DHA for children. Should I periodically take a break from Systemic Care?